271 shoes found. Page 1 of 14. 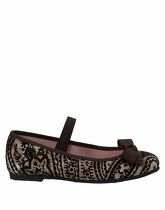 Textile fibres; rubber sole, round toeline, bow detailing, flat, velvet, floral design, leather lining. 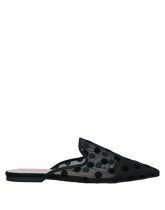 Soft Leather; fabric inner, elasticised gores, bow-detailed, round toeline, suede effect, two-tone, flat. Textile fibres; rubber cleated sole, round toeline, logo, flat, faux leather, solid colour, leather lining. Other Fibres; contains non-textile parts of animal origin, flat, solid colour, leather lining, buckle, round toeline, rubber cleated sole. Textile fibres; rubber sole, narrow toeline, no appliqués, flat, plain weave, solid colour, leather lining. Heel height 1.56 inches; Soft Leather; covered heel, solid colour, bow-detailed, round toeline, leather, varnished effect, square heel. Other Fibres, Textile fibres; leather lining, solid colour, glitter, round toeline, grosgrain, bow-detailed, flat. 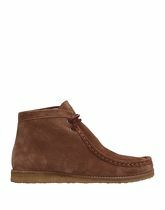 Boot length 4.1 inches; Boot width 8.97 inches; Soft Leather; flat, solid colour, suede effect, laces, leather, no appliqués, round toeline. Soft Leather; rubber sole, round toeline, contrasting applications, flat, leather, solid colour, leather lining. 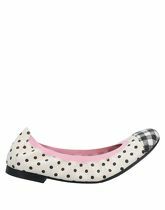 Soft Leather; contains non-textile parts of animal origin, flat, polka dots, leather lining, no appliqués, round toeline, rubber cleated sole. Soft Leather; rubber cleated sole, round toeline, laces, flat, leather, solid colour, leather lining. 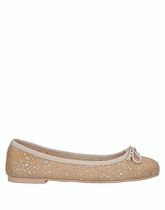 Pretty Ballerinas is, as the name suggests, a producer of ballerinas. The only company producing mostly this kind of footwear – this must mean a success. 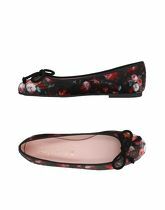 In the offer of Pretty Ballerinas every fan of these shoes will find an ideal pair or maybe a few of them. 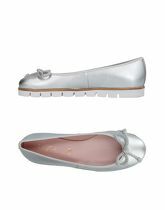 All possible materials, colors and patterns, ballerinas with decorations or plain ones, pastel ballerinas, in leopard print, from black leather or suede, flat-soled or on a low heel – it’s impossible to mention all models of their ballerinas. 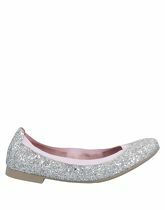 You should also have a look, even out of curiosity, at ballerinas encrusted with Swarovski crystals. 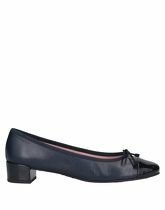 Apart from ballerinas, the brand also offers other types of women’s footwear; they are mostly romantic pumps and boots. Where did the idea come from? Pretty Ballerinas is a company with many years of tradition – the Spanish Mascaró family started producing shoes as early as in 1918. Many years of experience in designing and the feel for current trends make Pretty Ballerinas just bespoke. On this site you will find women's shoes in sizes from 2 to 9. There are 271 pairs of shoes starting with price of £46,00; 116 pairs from the whole collection are discounted at this moment. 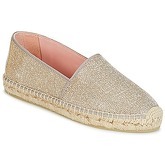 The most frequent shoes in this category are Ballerinas, Flats, Court Shoes and Sandals. There are 2650 brands, most of shoes comes from Office, New Look, Betty London, L' Autre Chose and Geox. The shoes are available in different colours, mostly in Black, Beige, Blue, Pink and Gold.